Chemists have made an artificial polymerase that doesn't need a metal catalyst or organic solvents and is more efficient than current bioinspired approaches. The new 'enzyme' is made from a dimer of two donut shaped cyclodextrin molecules; one cyclodextrin catalyses the reaction and the other holds the growing polymer string in place. Akira Harada, at Osaka University, Japan, and colleagues wanted to create a synthetic polymerase that would be efficient and also environmentally friendly - unlike polymerisation processes currently used by the chemical industry. They decided to investigate cyclodextrin molecules as a polymerisation catalyst because cyclodextrin molecules have been used as catalysts before. 'While we were investigating the preparation of polyesters using cyclodextrins (CDs) as catalysts, we found that CD plays roles not only as a catalyst but also as a kind of chaperone protein,' says Harada. 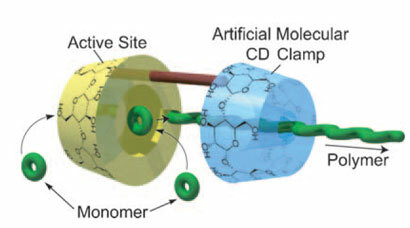 Harada explains that his CD clamp helps the process by threading onto the growing chain, increasing the polymer's molecular weight and slowly pulling the growing polymer from the active site. This opens up the reactive site for the next monomer, which then adds to the growing polymer. Because of this cooperation the polymerisation takes place without any solvents, making the process much greener. 'Harada's latest work really does have some fairly profound implications for both conventional polymerisation and DNA propagation,' says Peter Cragg, an expert on using macrocycles as artificial enzymes at the University of Brighton, UK. He describes the system as 'highly reminiscent' of DNA polymerase enzymes. 'We believe that this process is applicable for any polymer synthesis,' says Harada, who now hopes to test this claim in the lab.